Friend of JUTP David Rotenstein, recently relocated to Decatur, Georgia, posted this video over the weekend comparing Decatur's town square to Silver Spring's Veterans Plaza. Decatur, Georgia, and Silver Spring, Maryland have much in common. While Silver Spring has lost much of its historic core to development, Decatur's has remained intact with new buildings cheek by jowl with historic ones. Where Silver Spring's civic space is micromanaged by Montgomery County and the Peterson Companies, Decatur's is organic. Families share the space with teens on bikes and skateboards; restaurants line the square; and, none of the street life is contrived or micromanaged. This is what Silver Spring could have been and what it tries to be but because of poor planning choices, it will never be. I don't entirely agree with David's assessment of Silver Spring. There are still historic buildings, like the Perpetual Building, the Silver Theatre, which was of course incorporated into a new development, and others that can all be found on the Silver Spring Heritage Trail. Peterson Companies and the Regional Services Center host a number of concerts, festivals and markets in the downtown, but I wouldn't call the street life "contrived," as people have lots of other reasons to visit the area. And though I've never been to Decatur before, I'd argue that their street life isn't as "organic" as Silver Spring's because their downtown is filled with parking lots and surrounded by spread-out, disconnected suburban neighborhoods, whereas Silver Spring has thousands of people living in apartments downtown and fairly dense, sort-of gridded neighborhoods around it. In other words, there are just more people in and around Silver Spring to populate the streets. But I do agree that Downtown Silver Spring is micromanaged. Photography was banned in 2007 (and later struck down). Street performers and food vendors have been kicked out in the past. And, of course, there's been an off-again, on-again ban on skateboarding in the area. If anything hurts Veterans Plaza, it's attempts to overregulate the space. I'm sure Peterson and the Regional Services Center do so with good intentions, but they come at the expense of creating a vital, credible urban space. Decatur, meanwhile, seems to say, "Here. This is a public space, and you can use it, provided you don't inconvenience others and act up." There's a place for sidewalk dining. There's a place for skateboarding, behind the gazebo, which I assume is the place for performing. These agreements, often informal, are what makes urban spaces work. They show the community trusts the users of the space, which in turn allows the space's users (the public) to take ownership of it. Hanging out and watching skaters in Copley Square. David's video reminds me of when I went up to Boston for the American Planning Association conference last month and visited Copley Square, one of the country's oldest public spaces. Though Copley Square's located in one of Boston's most fashionable neighborhoods, there are street vendors and photography is always legal and skaters can even use the fountain when it's not running. And it works! No one seems to mind the noise, because it's drowned out by all of the other sounds of the city. No one's complained about kids defiling the historic Trinity Church or Boston Public Library, both on the square. The skaters stay in the fountain. There weren't any signs I saw directing them to do so, but it wouldn't hurt if there were. Either way, skaters themselves say cops only show up when your parking meter runs out. If a 150-year-old square in the middle of Boston can do it, and if a suburban town in Georgia can do it, Silver Spring can too. Veterans Plaza has the density, the activity and the people to be a truly great urban space. We just have to step back and let it happen. I've been to both Decatur and Silver Spring. I *vastly* prefer Silver Spring to Decatur. Now, don't get me wrong, Decatur is a great place, and one of Atlanta's better urban neighborhoods. But it does not have the vitality, streetlife, diversity of uses, walkability, or draw that Silver Spring has. While the old buldings still exist, the square itself was decimated by the construction of the MARTA subway station there in 1979. The station is underground, but just barely, and the roof of the mezzanine comes up to well over half the level of the 1st floors of the adjacent buildings. That means you can't see pedestrians or shops on the far side of the square. It also means that the sidewalks feel hemmed in. In fairness, the city of Decatur and MARTA have made some improvements to the station and plaza in recent years, but there's not much that can help with the station's structure being so prominent. Silver Spring is not the appropriate comparison to Decatur. No, Decatur is more like a poorly executed Wheaton (without the shopping mall). The Perpetual building might have worked as a contributing resource in a downtown historic district but the Planning Board found that it does not meet the criteria for designation and it was not forwarded to the Council. An appeals court ruling quashed local preservationists' efforts to get the property to the Council. Fascinating discussion!... Indeed, we should 'take it up' at Veterans Plaza one evening!... Interestingly enough I grew up next to Decatur, Georgia (in Tucker.) I lived through Decatur's trials and tribulations, requirements and regulations, and many of its ups and downs. Decatur is indeed a very cool and robust place... So is downtown Silver Spring. Having said that, we can certainly learn from each other. Regarding our Veterans Plaza being 'over-regulated', let's bring that to a public conversation as well - again, on the Plaza, of course. I totally agree with the guidelines. Are they posted in the plaza? They have exactly the kind of tone and intention a space like that needs. You know the regulations I'm talking about, though. I know it's a struggle to make sure that a public space is well-maintained and well-used, but there should be another discussion on what kind of activities can happen there. 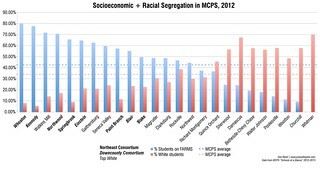 Reemberto, true enough Decatur lacks the significant ethnic diversity that Silver Spring enjoys. And yes, Decatur is a city. But I've gotta tell you that after spending 3 months back here in Atlanta and enjoying Decatur's revitalized downtown with its programmed and un-programmed events, there's very little I miss from Silver Spring's sterile experiment in social engineering. Decatur has become bikable and walkable. Yes, MARTA has some serious challenges and it is difficult to go an entire week without getting in a car. But we live a mile from downtown Decatur. Every night the sidewalks are full of people, as are the restaurants and stores. There are farmers markets, fairs, and festivals. Just yesterday we went to the Decatur Arts Festival and the live music sounded so much better because the acoustic environment (old and new buildings) didn't ruin the music. Listening to live music on Ellsworth was like listening to music inside of a can. Kids and adults mingle on the plaza in the courthouse square. They walk, sit, bike, drum, photograph, and skateboard all without Montgomery County's and Peterson's heavy hand. Silver Spring will never get back its early-mid-20th century historic buildings and landscape. The quality of the building stock now going up and the landscapes that enframe it may not make the cut for planners and preservationists 50 years down the road. Decatur, on the other hand, has wonderful old and new buildings that have been adapted to new uses. Residents are even discussing ways to turn 1960s office buildings into mixed use opportunities for residential and commercial uses. Matt, Wheaton is a poorly executed Wheaton barreling down a road towards stupid planning choices. Subsidizing Costco has to be one of the most boneheaded moves Montgomery County could have made since buying an old cabin it thought was "Uncle Tom's." Again, the planning efforts in Wheaton are social engineering efforts that may or may not work. 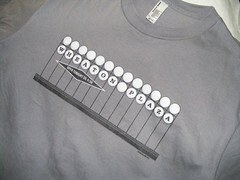 But will happen is the historical Wheaton will not be recognizable. I wonder what Uncle Tom's Cabin has to do over Silver Spring being a "sterile experiment in social planning." All of the things you describe about Decatur happen here, and many of them - Fenton Street Market, the drum circles you wrote about, and so on - were initiated by local residents. And I'm sure Decatur has some authority, not unlike Montgomery County's Regional Services Center, that programs events in the square. Downtown Silver Spring isn't perfect, but it's certainly not as bad as you make it sound - and it's not impossible to fix, either. Wheaton we'll have to wait and see about. Dan, I mentioned Uncle Tom's Cabin because it is one example of how the county wastes money without adequate forethought. It was on my mind because now MoCo is inviting people to take a very dubious survey it claims will help develop the park, yet another waste of precious tax dollars that could be used elsewhere within the Parks Department. Silver Spring's not bad; it's just suffered from top-down planning. All of the things initiated by local residents we both mentioned are great in both places and contribute to vibrant street life. Silver Spring's, however, is managed/boosted via Reemberto's office and Peterson. Decatur's isn't -- it just happens. True enough, there is local government involvement in the square, but it isn't as prominent and determinative as in MoCo. You would never get someone harassed for taking pictures in a public space here. And what does it say about MoCo that folks apparently can't behave well enough to skateboard or whatever in public? 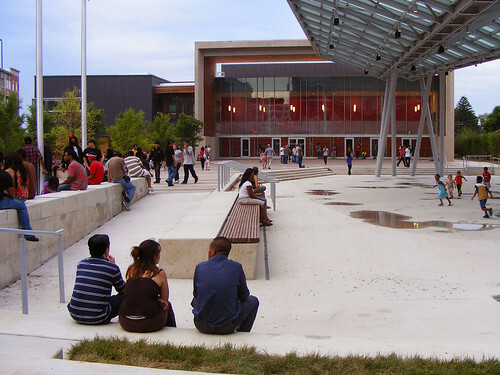 MoCo invested considerable resources in designing a public space that any reasonable person could recognize as attractive to skateboarders in a community with a long history of skateboarding in public and then regulates skateboarders out of the public sphere? As for beer in public? You'd think that the Deep South would be more uptight about having festival goers in a place like Decatur's square walking around with beer and having beer vendors throughout the festival. Not so. Will that ever happen in Silver Spring? No. Now let's turn to locally owned and operated businesses. LOIS, as Shuman calls them. Yes, downtown Decatur as a CVS, a Starbucks, and a Ruby Tuesday. But the overwhelming majority of downtown businesses are locally owned and operated. Money spent in downtown Decatur is reinvested in downtown Decatur, not in St. Louis (Panera), Orlando (Red Lobster), Atlanta (Chick Fil A), etc. Family owned businesses like the dry cleaners aren't run out of town or displaced from longtime locations simply to appease CVS. Silver Spring is a great place and it could have been much more than what it has become. Ask county planners who continue to spend a mint on out-of-state consultants to advise MoCo on parking, zoning, parks, etc., why they couldn't find any local talent to advise them. Local firms ride shotgun in a nod to keeping locals involved but it's the big firms from the Midwest and West who hold the profitable consulting contracts with the Planning and Parks departments. I understand your beef about chain stores, as it's a frustration many people share. But there are non-chain stores in downtown Silver Spring, and I'm sure they compare favorably to those in Decatur. I don't understand your remark about Montgomery County "importing" planners from elsewhere. Any place that only looks to itself for solutions is probably a terrible place. Being insular might create "authenticity," but it also means you can't benefit from the good ideas created elsewhere. No matter what you think of our planning director, Rollin Stanley, it's impressive that a suburban county could snag a nationally (internationally?) renowned planner to come and work here. That said, Peterson Companies is a local firm that works primarily in the DC area. The area along Ellsworth Drive was designed by RTKL and Brown Craig Turner, two architecture firms both based in Baltimore. So local minds do have a hand in downtown Silver Spring, even if it's not readily apparent. Lafayette, CO, to do the Parks Department's "Vision 2030" project. All of these firms are racking up major frequent flyer miles and billings for these projects, paid for by Montgomery County residents. "Any place that only looks to itself for solutions is probably a terrible place. Being insular might create 'authenticity,' but it also means you can't benefit from the good ideas created elsewhere."